The MOSS-2 is an ideal sampling tool for use with one or two OdaLog PPM H2S Gas Loggers. Designed to facilitate OdaLog data collection in locations where substantial positive or negative pressures are present, such as inlet and outlet sampling, and in locations with up to 100% relative humidity, as these conditions can affect the OdaLog measurements. For quality data collection where these adverse conditions are present, it is necessary to present a constant flow rate similar to the calibration flow rate. The MOSS-2 accomplishes this through the use of a regulated one-liter pump; two adjustable flow meters housed within a durable corrosion proof case and external moisture removal traps. The pump draws the air sample through moisture removal traps prior to introduction to the flow meters and subsequent delivery to the OdaLogs. 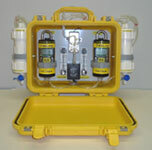 The flow meters are set by the user to 0.40 LPM and deliver a constant gas sample to the OdaLog H2S Gas Logger. The traps shield the sensor and flow meters from over-exposure to condensable moisture. Either one or two PPM OdaLogs may be used in conjunction with the MOSS-2.